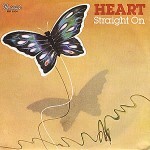 “Straight On” by Heart uses something music theorists call modal interchange. This is where you combine chords from different keys that revolve around the same tonic. Basic Straight On guitar chords here. Bm A G are vi V IV from the key of D, which is also the key of B minor or B Aeolian mode. Bm E are ii V from the key of A, which is B Dorian mode. Bm Dsus2 are also B natural minor or B Aeolian mode. Bm F# stem from the B harmonic minor scale. This is where you take a B natural minor scale (Aeolian mode) and raise its 7th in order to create a dominant V chord. Notice that each of these keys centers on a Bm chord. They are parallel scales rooted on the same tonic. You can use B minor pentatonic the whole time. Or you can switch scales, B minor scale, B Dorian and B harmonic minor (you only play harmonic over the F#). Key changes, modal interchange and the harmonic minor scale are covered in my Fretboard Theory guitar theory program. I enjoyed checking out your website. I am trying to find a musician that will sell me some chord progressions for my website https://www.lyricyard.com or send me some in exchange for free advertising. The format requested from the lyrics writer is 8 lines with 9-12 syllables per line. And these chord progressions that I’m acquiring to make up my 21 “melodies” will pause after 9-12 syllables. These chord progressions need to keep in mind that though the lyrics writer is submitting just 8 lines of lyrics, if they like the vocals added, then they will have the option of giving the complete lyrics to the singer to complete. So these chord progressions would need to be just a piece of the larger song. Instead of 8 lines, would you bump that up to 10 to allow for the development of the chorus? If there’s any way drums could be added as well, that would be a big plus. Sounds like an interesting idea, Randall, but I’m not able to get involved at this time. Good luck!